And, just like that, metal becomes magic. The space shuttle was an amazing technical creation, a structure of metal and composites and tile and glass and thermal protection blankets that could rise majestically through the atmosphere in defiance of gravity and could cradle humans safely through the inhospitable void of space and could glide back home in a way far too graceful for her stocky form. Amazing. But the magic? Walk up to an orbiter today, and it’s amazing, but inert. Metal and composites and glass and tile and thermal protection blankets. A machine. The magic came when she was on the pad, fueled for launch and ready to leap upwards. A living thing. Astronauts who knew the machine intimately were surprised at the shuttle they boarded on launch day – hissing and venting and groaning. Breathing. Coiled with purpose. Visceral. Alive. No longer creation but creature. Astronauts say that boarding a fueled space shuttle prior to flight was an amazing experience. As if that needed to be said. 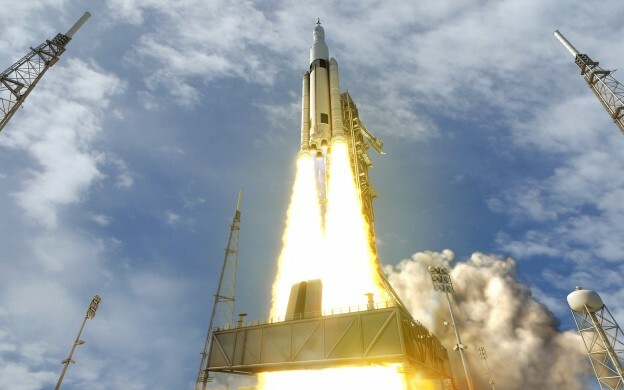 Last week, the Space Launch System (SLS) program completed its Critical Design Review, a first in almost 40 years for a NASA exploration class rocket. Through the CDR process, review teams go through designs and plans for the vehicle with a fine-tooth comb, and then go through the results of that with a finer-tooth comb. On paper, in PowerPoints, in CAD designs and mission animations, SLS is amazing. In its completed configuration, there’s nothing like it. Unequaled lift capability. Unequaled launch thrust. Unequaled payload volume. Unequaled power to propel robotic vanguards into the depths of the solar system. A machine that in its very form hints at its purpose – “to strive, to seek, to find, and not to yield.”* Amazing. But magic isn’t in paper. The thing that surprises many people when we talk to them about SLS is how much metal there already is, how much of the machine already exists. It’s not magic yet, but it’s something else amazing – it’s real. Right now, the first rocket, the first SLS that will leap from Earth, is still only a glimpse of what she’ll become. The rocket is still in pieces, and those pieces are spread out around the country. Some pieces have yet to be built. But when you go to the places where those pieces are, you begin to understand how real this machine already is, how amazing it will be when finished, and, just maybe, a little bit of the magic this metal will eventually hold. Work today on the core stage gives a sense of the scale of the vehicle. 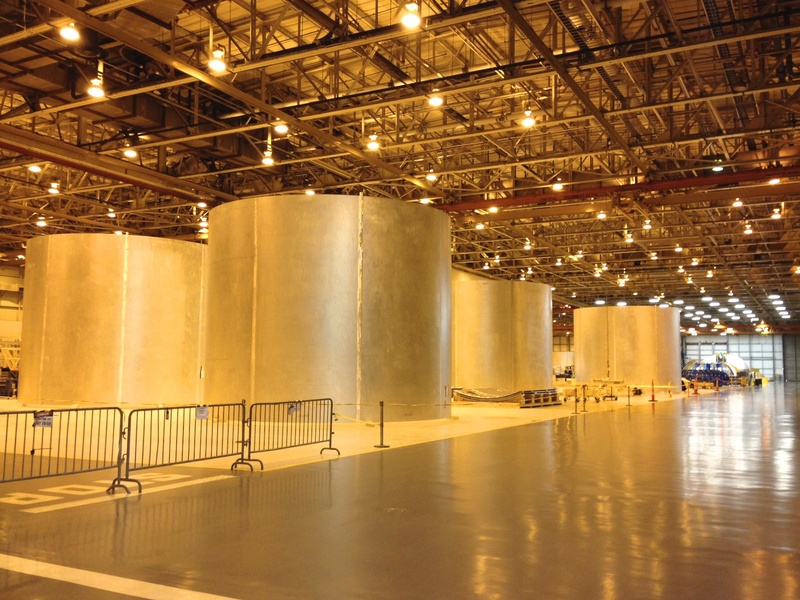 Michoud Assembly Facility outside of New Orleans is filled with very large pieces that will be used to build something much larger — 27.6-foot-diameter barrel sections, rings, and domes that will form the oxygen and hydrogen tanks for both structural test articles for ground testing and the first flight core stage. This fall, the structural test article tanks will be welded, and by the end of the year, all of the barrel sections for the first flight vehicle will be completed. 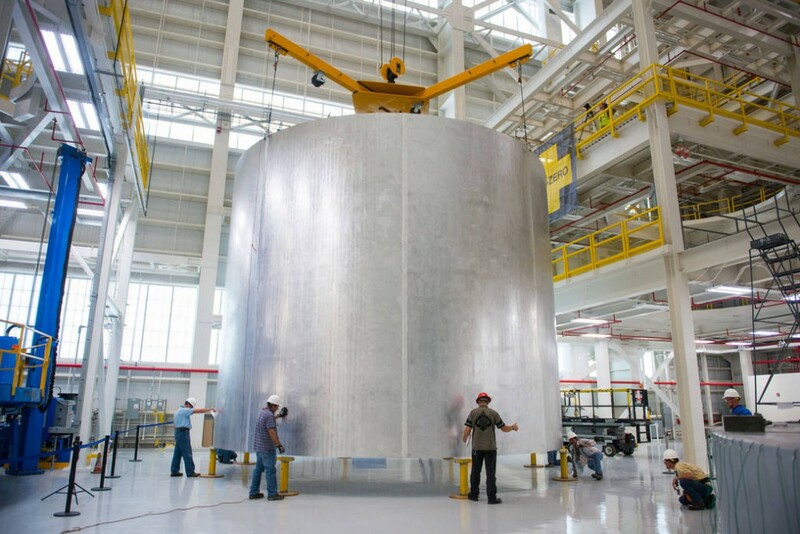 The test article tanks will be shipped next year to Marshall Space Flight Center in Huntsville, AL, where new test stands are currently being built to subject the tanks to the stresses of launch. Also at Marshall, testing is taking place on the avionics systems hardware and software that will control the rocket during ascent, integrating the “steering” of the core stage and the boosters. Marshall is also the site of work on two stage adapters. 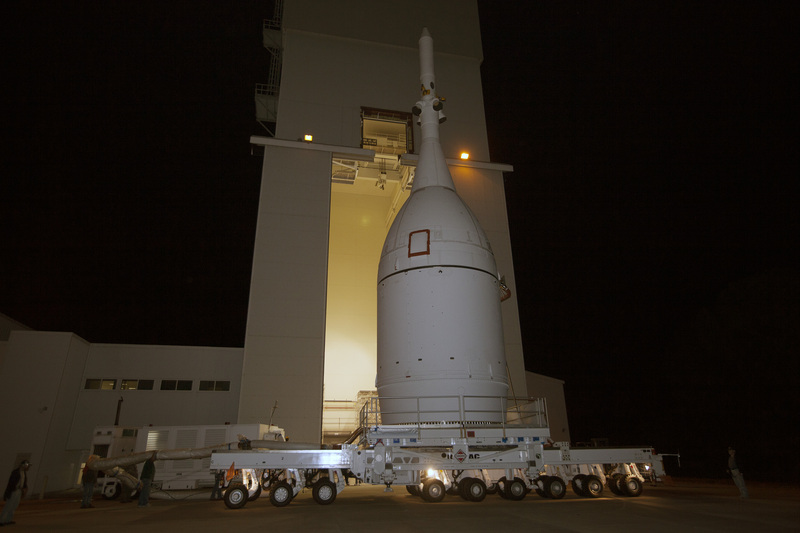 The center has already produced two units of the smaller one, the Orion-Stage Adapter (OSA), which connects the Orion spacecraft to the rocket’s upper Interim Cryogenic Propulsion Stage (ICPS). The first OSA was used as a test article, the second one was the first original SLS hardware to fly into space. It was launched in December 2014 on Orion’s Exploration Flight Test-1 on a Delta IV rocket, which sent Orion 15 times higher than the International Space Station’s orbit. Materials are currently arriving for a third unit, which will fly on the first launch of SLS. The tapered part at the bottom of the Orion stack in this picture was the first original SLS hardware to launch. The larger adapter, the Launch Vehicle-Stage Adapter (LVSA), will connect the core stage to the ICPS; welding began this month on the adapter test article. The ICPS upper stage is being built about 25 miles from Marshall at a United Launch Alliance facility in Decatur, AL. The test article for the stage will be completed and transported to Marshall this fall for testing; work on the first flight stage began this month. The ICPS is a modified version of the upper stage of a Delta IV Heavy rocket, like the one that launched Orion for EFT-1. Sixteen RS-25 engines for the first four flights of SLS are already in inventory at Stennis Space Center, in Mississippi, where engine testing is currently underway. The testing subjects the RS-25 engines, which previously flew on various space shuttle missions, to the different conditions they will experience on the SLS. The engines have been successfully completing tests at the higher SLS thrust level, using a new engine controller unit, with such new conditions as higher flow pressure and lower temperature of the propellant coming into the engines. 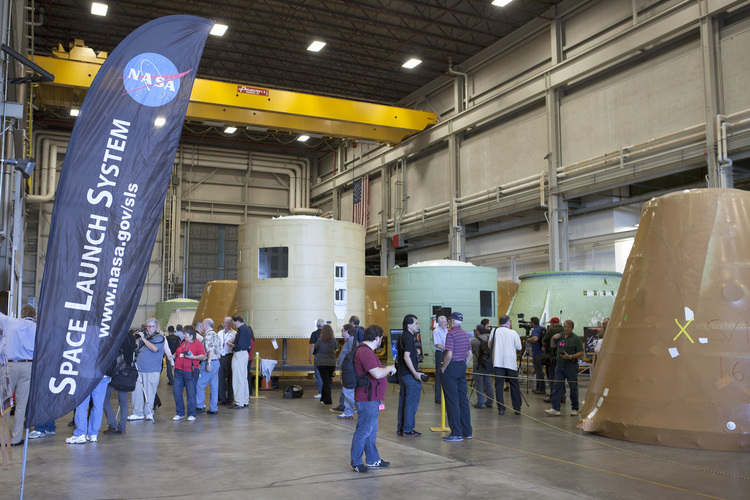 Flight hardware for the solid rocket boosters for the first SLS flights is at the Booster Fabrication Facility. Before the segments there are cast with propellant and assembled into completed boosters, one more qualification test firing of the boosters will be performed at an Orbital ATK facility in Utah. The first of these test firings was conducted in March 2015 at the facility, qualifying changes to the boosters, including the addition of an extra propellant segment to make the boosters more powerful, as well as new insulation, processing and inspection techniques. After a second test next year, the flight boosters will be assembled, incorporating changes demonstrated in the tests. In all of these places, you can see pieces of the machine – very real, very concrete. Things we can touch. It’s not the full machine yet. But you begin to get a picture of what the machine will be. You stand at the base of a 22-foot-tall core stage barrel, and you can imagine the immensity of a stack of them almost ten times that tall. You see one RS-25 engine firing, and mentally picture four of them roaring together. You see a barrel in one place and an engine somewhere else and a booster in another place and an adapter in another, and you begin to see a rocket taking shape. And, sometimes, particularly in the engine and booster tests, you see a little something more – you see the machine come alive, hissing, venting, breathing fire and steam. And you see the incredible – you see engines with the power to summon rain from the sky, you see boosters that can create glass from the desert sand. For just a moment, you get a glimpse of the magic in the metal. Next Time: How Is A Test Stand Like A Space Ship? * From ”Ulysses,” by Alfred Lord Tennyson, who, in full disclosure, was not actually writing about a rocket. Just What Is An SLS, Anyway? For those lucky enough to be at or near Kennedy Space Center when a Space Launch System rocket leaves Earth for the first time, it will be an unforgettable experience. Any rocket launch is amazing to witness in person, but the rise of a truly powerful launch vehicle, like the space shuttle or the Saturn V, is a different thing altogether. It’s not merely impressive; it’s visceral. It’s not something you witness; it’s something you experience, a brightness that seems like the sky has split open, a sound that you hear with your entire body, a power that passes into and through you. 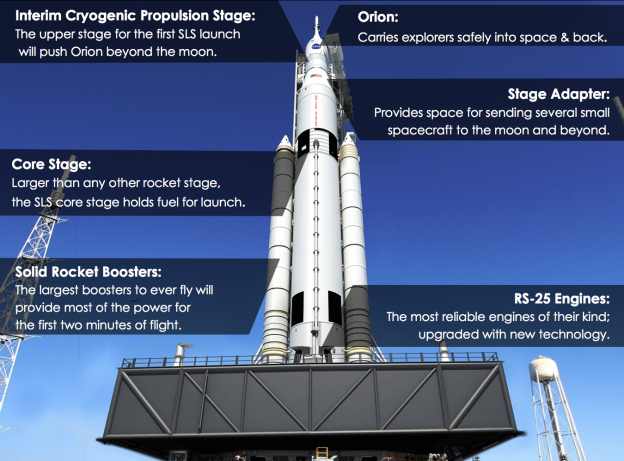 The first SLS will push off the launch pad with more force than either the Saturn rockets are space shuttle. And for all the reasons that shuttle and Saturn V launches were in a different class, that first launch of SLS will be unprecedented; the power emanating from the vehicle, through the air and ground and into its audience measurably greater than either of those forbearers. That unparalleled power will initiate an unparalleled mission – propelling the Orion spacecraft behind the moon, farther than any Apollo capsule ever ventured, proving that the system is ready to allow human beings to once more travel beyond low Earth orbit for the first time in decades. That rocket, the first flight unit to come off the line, is already under construction. Today, large portions of that very vehicle can be found at NASA locations in three states. At Stennis Space Center in southwest Mississippi, engines for that first flight, and the next three after it, are already in inventory. 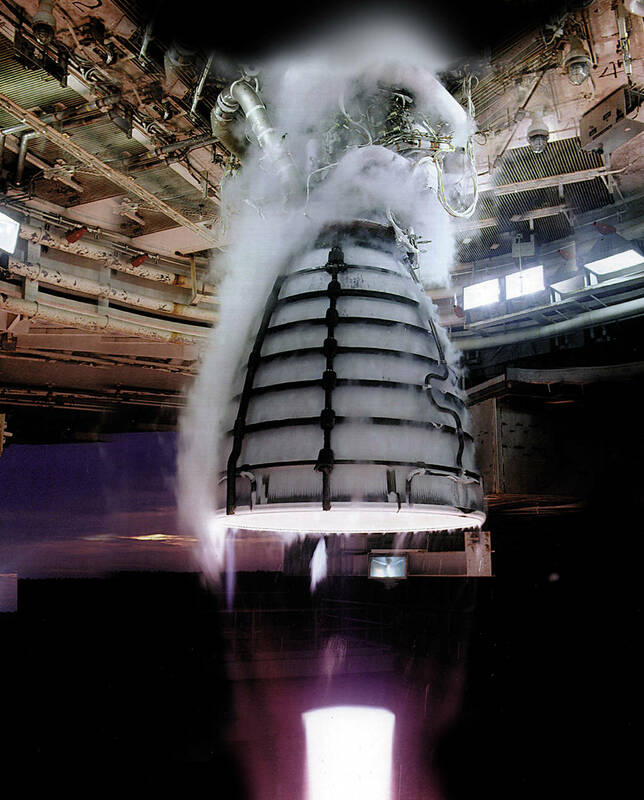 The RS-25 engines were formerly better known as the Space Shuttle Main Engine, and at the end of the shuttle program, 16 of its engines were transferred to the SLS program. While the shuttle used three of the engines per flight, SLS will use four; one of the ways the rocket is generating greater power than shuttle. Engine tests are being conducted now to check out improvements made to the engines since they last flew. Engines on the shuttle ran at 491,000 pounds of thrust in vacuum (104.5-percent of rated power level). After analyzing temperature and other factors on the engine, the power level was increased for SLS to 512,000 pounds vacuum thrust (109 percent of rated power level). At Michoud Assembly Facility outside New Orleans, the core stage of the first vehicle is being built. At one point, Michoud covered more square footage than any building in the country – 43 acres under one roof – and today large rooms are filled with rocket hardware. Barrels, rings and domes, 27.6 feet across, are coming off of welding machines and being stored awaiting the day they will be assembled together into fuel tanks. (For the test articles, that day will be this fall.) The SLS core will be the world’s largest rocket stage, and standing in front of those welded segments gives you a sense of just how big that is. In this picture, you can see four of the 27.6-foot-diameter barrels for the SLS core stage. Imagine taking those four barrels and stacking them on top of each other. That’s still only about two-thirds the height of the core stage hydrogen tank. Which, in turn, is less than two-thirds the height of the entire core stage. Which, in turn, is less than two-thirds the height of the entire rocket. See? You start to get a sense of how big this thing is. At Kennedy Space Center in Florida, a large warehouse holds booster hardware for the first flight. As with the engines, the boosters for the first SLS flights are being repurposed and upgraded from the space shuttle program. The large white solid rocket boosters on the sides of the shuttle were actually a stack of multiple segments, with the four in the middle holding the propellant. The SLS boosters will be stacked with five propellant segments, also giving the rocket more power. Pictured here is 3.6 million pounds of thrust, some assembly required, at the Booster Fabrication Facility at Kennedy Space Center. At Marshall Space Flight Center in Huntsville, Alabama, two large adapters will be built; one to connect the core stage to the upper stage, and the other to connect the upper stage to Orion. When all of these elements are completed, they will be transported to Kennedy Space Center for final assembly of the full rocket in the Vehicle Assembly Building. 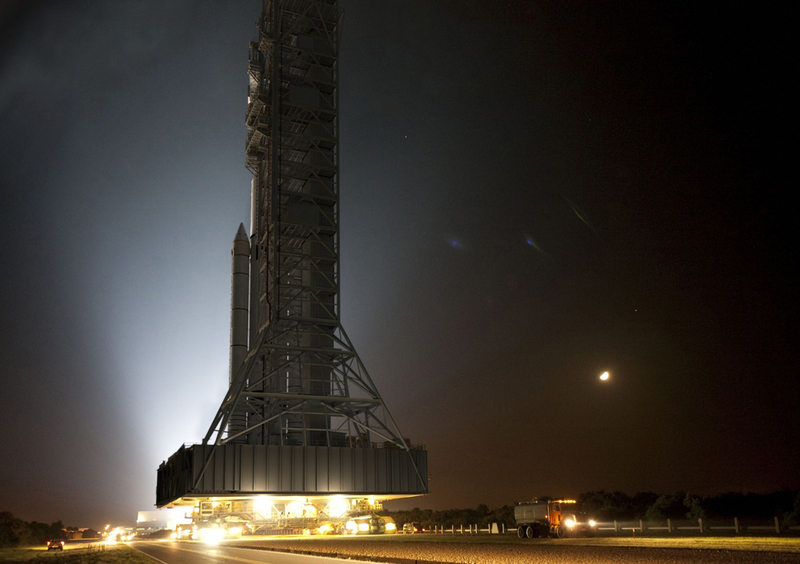 The entire SLS-Orion stack will tower 322 feet tall, and, when fueled, weigh more than five and a half million pounds. At launch, the rocket will generate 8.4 million pounds of thrust, and have the power to launch more than 70 metric tons of payload into Earth orbit… or to send Orion farther into space than humans have ever ventured. …And, of course, to give the Florida space coast a show like it’s never before seen. The crawlers at Kennedy Space Center are no strangers to big rockets – they carried the Saturns and space shuttles to the launch pads since the 1960s. Even so, they had to be strengthened in preparation for transporting Space Launch System. Next Time: Hey, How’s It Going? Let’s say you need to build a new rocket. Where do you start? Well, what kind of rocket are you going to create? 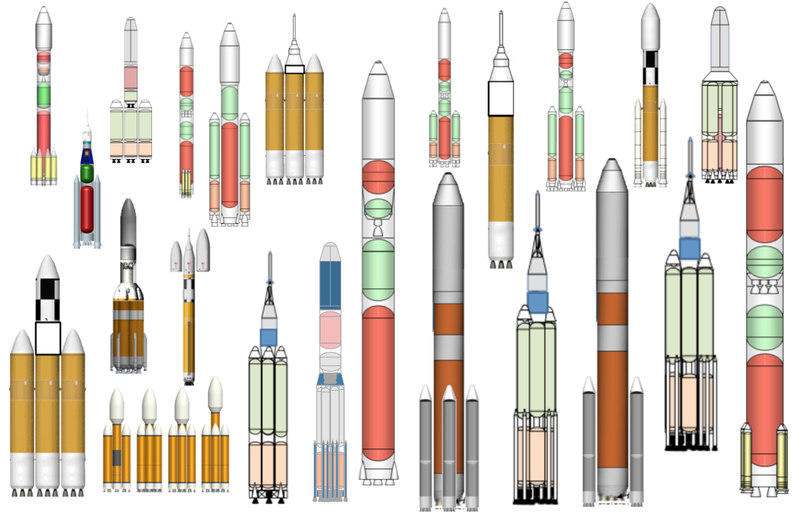 All rockets, after all, are not created equal – the world is full of a variety of rockets, all designed for different purposes. Step One: Know What Your Rocket Needs to Do. In order to know what kind of rocket you’re going to build, you need to know its requirements. For the sake of this hypothetical example, let’s say the new rocket you need to build is to be designed for the purpose of human exploration of deep space. Specifically, it’s going to be the rocket that will enable human missions to Mars, far and away the most ambitious task ever undertaken in spaceflight history. A bold mission requires a bold rocket. 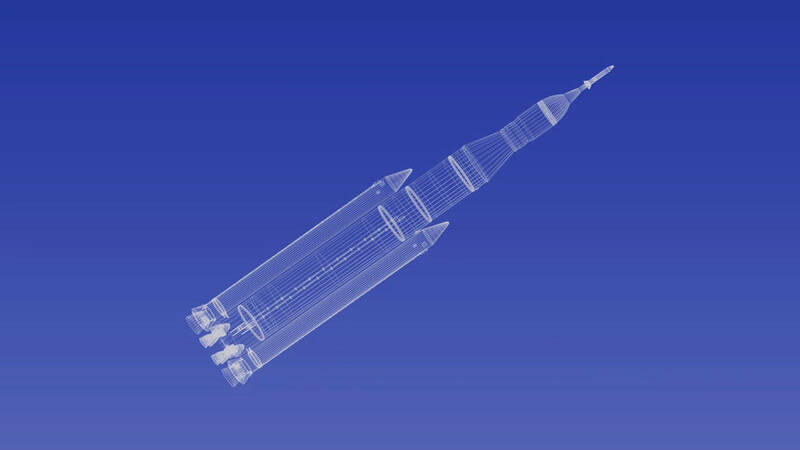 Blueprint of everything you need to build your own SLS, except for all the inner working that actually make it fly. Step Two: Establish Mission Parameters. Over history, there have been numerous studies of how to get to Mars, so you take the best data you can get and figure out what it takes to execute those missions. The general thinking is that you’re going to need multiple launches to carry out the mission, but even with multiple launches, there are going to be some really big pieces. You’re going to have to be able to lift at least 130 metric tons of stuff (a.k.a. payload) into Earth orbit. Many engineers think your lander may measure up to 30 feet across, so you need a payload volume big enough to carry it. Step Three: Call in Experts. You work with other rocket designers, in both the government and commercial spaceflight worlds. You listen to a lot of ideas. And I mean, a LOT of ideas. You start creating rocket designs. You work from a blank sheet of paper. In fact, you get a lot of blank sheets of paper. Reams of paper, really. Step Five: Whittle Down the Possibilities. The challenge, it turns out, is not to design a rocket capable of supporting human missions to Mars. The challenge is designing the BEST rocket for the mission. And the real challenge of doing that is knowing which rocket is best. What’s the standard for “bestness” in a Mars rocket? It’s a more complex question than it might sound – it’s vital, for example, that the rocket be powerful, but the best rocket is not the one that’s most powerful. Once you have enough power, more power makes less difference. As you probably guessed, this question is not completely hypothetical; four years ago, this exact scenario led to the birth of Space Launch System. Engineers were tasked with designing the 130-metric-ton Mars rocket described above. They called in government and industry experts. They reviewed more than 1,000 possible designs for the vehicle. A selection of just a few of the major designs considered in early SLS studies. This graphic became known amongst the team as the “bedsheet” graphic, because, well, it would make an awesome sheet for a kid’s bed. In the case of the SLS, some concepts were easy to reject: there were clearly better choices, for example, than the rocket that was too wide to fit out of the giant doors of the Vehicle Assembly Building at Kennedy Space Center. 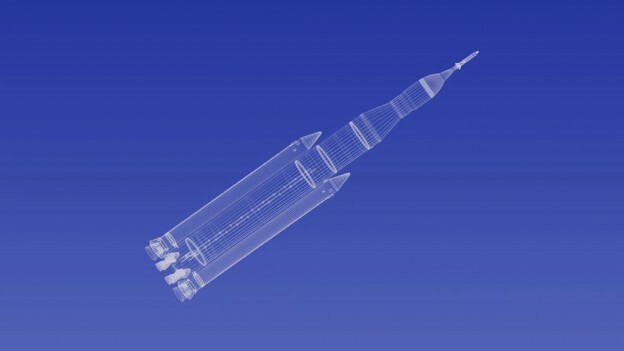 Three stood out – a Saturn-like large, multi-stage rocket, using the kerosene fuel that powered the moon rocket instead of the shuttle’s liquid hydrogen; a rocket built from components based on current smaller rockets, taking advantage of industry successes; and a design that would be an evolutionary step from systems used on the space shuttle. But which was best? External constraints had to be considered – in addition to the guideline that the rocket had to support human deep space exploration, national policy said it had to use, where possible, resources from the then-about-to-end shuttle program and earlier Constellation development effort. Any of the designs could have met this guideline; NASA worked to pick the design, and then identify existing resources that could facilitate its development. NASA chose three additional standards to measure the rockets – any qualified design would be judged by how well it met standards of safety, affordability and sustainability. Each of the three had strengths and weaknesses; engineers studied and debated the pros and cons of each. Ultimately, while the Saturn-like rocket was a good design, the time and cost needed to design, build, and launch it was too great. The smaller-rocket-derived design, in contrast, offered development advantages over the kerosene vehicle since the existing hardware and support systems provided a head start, but its complexity counted against it in the safety measurement. If you don’t have a barge, you can get the same effect by strapping a whole lot of rowboats together, but it’s not going to be the same. The remaining design, based on a combination of upgrades to shuttle systems and new developments, provided advantages in shortening development time and reducing costs, and offering safety advantages through the use of proven propulsion systems. Step Six: Pick the Best Design. And so from the thousands, one remained — the design that could not only carry out the mission to Mars, but could do so most safely, affordably and sustainably. The lengthy journey to the launch pad had begun. Next Time: Just What Is An SLS, Anyway? Someday, the story will be told of humanity’s greatest endeavor, the bold stretch across the harsh void of space to reach for another world, of how brave explorers set sail through a perilous nothingness armed only with their wits and the best vehicles and systems with which modern engineering could provide them, until they passed through the unwelcoming atmosphere of an inhospitable world millions of miles away and finally set foot in the dusty, rusty regolith of the Red Planet. This blog is not that story. This blog is the prologue to that story. When you watch a space story, it usually starts with the rocket already on the launchpad, or the starship already in port. It doesn’t matter how it got there, it just matters that it’s there. Rarely do you see the movie that tells who built Columbus’ ships, who forged Excalibur, who installed Captain Kirk’s chair on the bridge of the Enterprise, who bolted together the rocket that carried Neil Armstrong to the moon. This blog is that story. Leaving the launch pad, SLS will generate more thrust than the space shuttle or the Saturn V! NASA has begun the Journey to Mars, an integrated approach to exploration that will result in human landings on the Red Planet. The Journey will require much of the best of what NASA does – from robotic rovers sending back scientific data to astronauts on the International Space Station studying how long stays in space affect the body to engineers developing cutting edge technology to overcome currently impossible challenges. A foundational capability in the Journey will be the Space Launch System, NASA’s new rocket that will be the most powerful launch vehicle in history, designed from the ground up to meet the challenges of human exploration of deep space. Sending astronauts to Mars will require massive new exploration systems, and SLS will be the rocket that will send them into deep space. 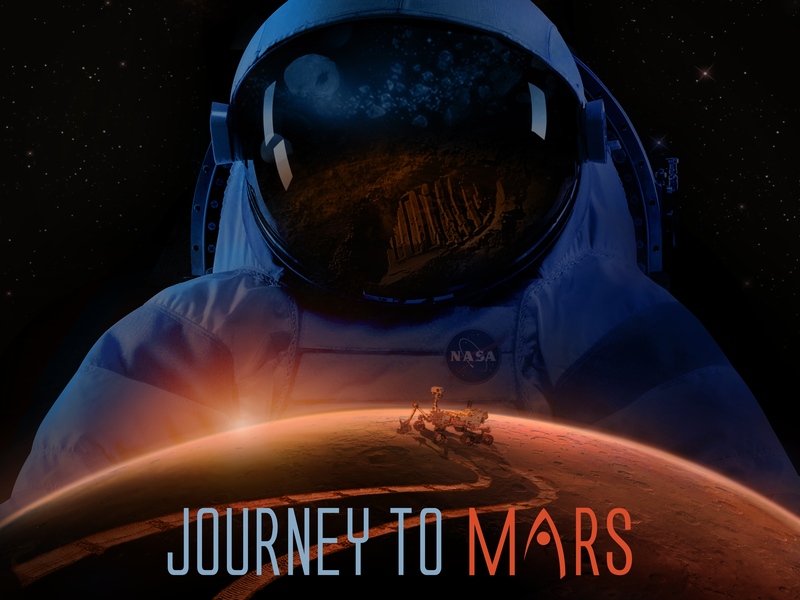 NASA’s Journey to Mars, coming soon to a planet near you! Like the Journey to Mars, SLS is built on NASA’s best, combining America’s past successes with state-of-the-art developments. SLS will give new life – and new upgrades – to the proven engines and boosters that powered the space shuttle, combining them with the largest rocket stage in the world. And that’s just the beginning; future upgrades will make SLS even more powerful. With this blog, we’ll be giving you the story of the SLS rocket before it reaches the launch pad – a rare, once-in-a-generation behind-the-scenes look at how NASA designs, builds and tests a massive launch vehicle like none other in the world. We’ll be pulling back the curtain on the real-world “rocket science” – and rocket scientists – that will make possible the first footsteps on another planet. Your docent for this tour will be David Hitt. I work in the strategic communications office of Space Launch System, helping to tell the story of NASA’s next great rocket. 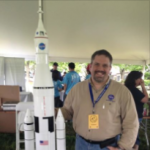 I first began working at NASA’s Marshall Space Flight Center in 2002 in education. I have a passion for history, and for NASA’s history – as a hobby, I’ve written two books on the subject – and so I’m fascinated by the opportunity to be witness to the unfolding of the next incredible chapter of that history. The Journey to Mars has begun. Thank you for joining us on the journey.